His Eminence had the opportunity to greet President Obama, the First Lady and their daughters Malia and Sasha in a private holding room prior to the 50th anniversary commemoration rally. Following the presidential address, Archbishop Demetrios marched with President Barack Obama and his family, former President George W. Bush and his wife Laura, U.S. Senators and Congressmen, and leaders who had participated in the 1965 events. 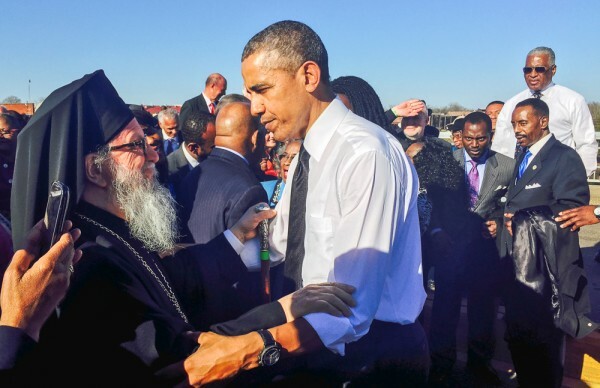 After thanking everyone for their participation and before departing, President Obama embraced Archbishop Demetrios and noted the significance of faith in the Civil Rights Movement. Congressman John Lewis, who walked the bridge on Bloody Sunday 50 years prior, asked Archbishop Demetrios to offer a prayer for the people of Selma and for the Nation. As the Archbishop of America and the successor of Archbishop Iakovos, a staunch supporter of the Civil Rights Movement and the highest-ranking religious leader to march alongside Dr. King in Selma in 1965, Archbishop Demetrios continues the longstanding legacy of the Orthodox Church to fight against racism and to defend human rights. Archbishop Demetrios of America is the leader of the Greek Orthodox Church in America and the Exarch of the Ecumenical Patriarchate. He is also the Chairman of the Assembly of Canonical Orthodox Bishops of the United States of America.